This Calendar has many aspects: a basic introduction to astronomy, a simple ephemeris, a planting guide, a star map, aid for following the movement of the planets in the night sky, and articles by ten different authors. All of these attempt to provide a true picture of the world outside us and ideas to assist in developing a healthy relation to that world. "What can I do to make the world better? This is a question I try to ask myself in all situations of life. There are no rules, but in general I find that I need to learn to observe ever more carefully, and at the same time broaden my perspective. 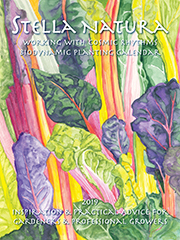 This Calendar offers opportunities to support both of these efforts, in its introductory pages and monthly charts, which give planting advice according to lunar and planetary rhythms, as well as in its many articles. "I'd like to emphasize what an enhancement of life can come from looking up into the night sky to follow the phases of the moon and the passage of the moon and planets through the starry constellations. Page twelve gives a preview of things to look for, month by month – read ahead, because there are often special sights at the very beginning of the month! If you use the star map at the end of the Calendar to learn to recognize the constellations, you will feel yourself as a true observer of the world and the planting advice will come to life. By adjusting the timing of your gardening and farming activities to the wider environment of our earth, you will not only be acting in your own best interest but will be bringing your actions and the life of the plants in your care into harmony with the sources of life and health on earth. "The articles focus on specific subjects and yet treat them from a wider perspective. I hope you will take the time to read what I have written about Rudolf Steiner's social ideas, which have so much to offer for innovative approaches to economics, cultural arrangements, and politics. You will also find a history of how materialistic thinking has affected the soil and landscape of America, and an article pointing to farmers as the agents of change through their evolving consciousness. I hope you will be inspired by another article to use your collective influence to create local consumer associations to create the kind of food systems you want. An arborist helps open our eyes to the trees that surround us; and a master gardener leads us on an imaginative journey into the complex, rich life of the processes within the plant. Another biodynamic gardener shares the thirty-year arc of his career, as he developed the individuality of his farm and then passed it on to the next generation. A teacher describes how growing food provides healing as well as education for her students. A doctor elaborates on the concept of Salutogenesis – the origin of health. Another author introduces us to a new way of seeing invasive species, and we are told the Navajo story of "Little Dawn Boy." Through this story and all of the articles we are invited to participate in a renewal of agriculture, which can indeed make the world better!"